Which Protestant churches today can trace an unbroken line of apostolic succession directly back to the apostles, and therefore, to Christ Himself? How can disunity and division continue to multiply within Protestantism, when each denomination claims to be led by the Holy Spirit and follow the Bible alone as their sole authority? How can we explain more than 30,000 different Protestant denominations when our Lord established one Church, promised it would never fail, and prayed for the unity of all Christians? "This is not merely a story but a practical guide for the novice and expert alike, dealing with crucial issues such as the Eucharist, Bible and Tradition, Apostolic succession, Mary, the saints, icons and statues, and much more. I highly recommend Troy’s book!" 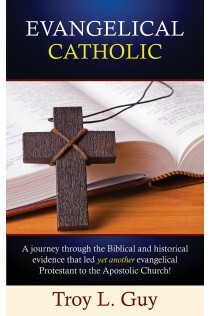 "Amazing defense of our beloved Catholic faith, written with love and affection." TROY L. GUY lives in Texas with his wife, Lisa, and their four children. He works in the aerospace industry and holds degrees in physics and in electrical and nuclear engineering. He is an FAA-certified commercial pilot and flight instructor. Troy is a Graduate of Texas A&M University.